The VSWR30-1SSRN features 6 shelves that can hold up to 5 bottles each for a maximum bottle capacity of 30 bottles. The maximum capacity can be reached with many different bottle sizes and is only affected when adding in larger Pinot or Champagne bottles. A clear digital display with user friendly push button controls makes setting and monitoring the temperature quick and easy.Cool blue LED lighting beautifully elegantly illuminates your bottles while remaining cooler than standard bulbs, and can be turned on or off with the push of a button. This bottle is taller than the standard 750 mL bottle. It measures 12-1/16" tall with a 2-15/16" diameter and the shoulder tapers up from 8" to 9". The taller shoulder makes the bottles touch and pushes the outer bottles over the edge of the shelf. This is not a problem on the top shelf or the bottom shelf, but it does create an issue on the remaining four shelves. On those shelves, you can alternate 3 of these bottles in front with 2 standard 750 mL bottles in the back, allowing you to store up to 22 of these wine bottles without having to reconfigure the shelves or affecting the overall bottle capacity. This bottle has the same diameter at the base, but the shoulder is wider. It measures 11-7/8" tall with a 2-15/16" diameter at the base and the shoulder tapers up from 7-1/2" to 8-1/4" with a 3-1/16" diameter. The wider shoulder pushes the outer bottles over the edge of the shelf. This is not a problem on the top shelf or the bottom shelf, but it does create an issue on the remaining four shelves. On those shelves, you can alternate 2 of these bottles in front with 3 standard 750 mL bottles in the back, allowing you to store up to 18 of these wine bottles without having to reconfigure the shelves or affecting the overall bottle capacity. Other 15" undercounter wine refrigerators would not fit these bottles without removing shelves. Until now, you wouldn't dream of fitting a Pinot bottle in a wine refrigerator without removing wine racks and drastically reducing the overall capacity. It measures 11-5/8" tall with a whopping 3-1/2" diameter and the shoulder tapers up from 5-1/2" to 8-1/4". 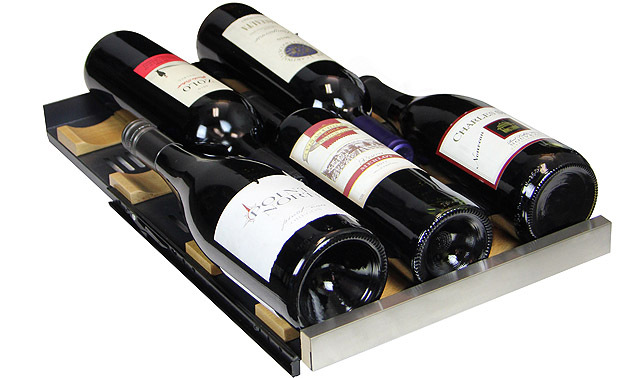 On this model, you can fit 5 pinot bottles without reducing the overall capacity or reconfiguring shelves. Three bottles fit on the bottom shelf and two more fit in the outer front grooves of the top shelf (the light does not allow a bottle with this diameter to fit in the center front groove of the top shelf, but another bottle of any type can fit there).